Identification: Smith (1985); Hubbs et al. (1991); Page and Burr (1991); Jenkins and Burkhead (1994). Native Range: Atlantic and Gulf Slope drainages, from New Brunswick to central Florida, and west to the Apalachicola and Choctawhatchee drainages, Georgia and Florida (Page and Burr 1991). Table 1. States with nonindigenous occurrences, the earliest and latest observations in each state, and the tally and names of HUCs with observations†. Names and dates are hyperlinked to their relevant specimen records. The list of references for all nonindigenous occurrences of Lepomis auritus are found here. Means of Introduction: Intentional stocking for sportfishing. Status: Established in most locations. Impact of Introduction: There is circumstantial evidence to indicate that Redbreast Sunfish are displacing native longear sunfish (L. megalotis) in eastern Tennessee through direct competition (Etnier and Starnes 1993). 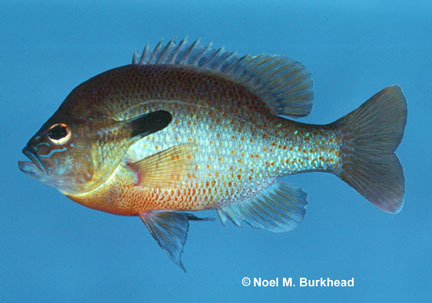 Will form natural hybrids with warmouth, green, bluegill, and pumpkinseed sunfish (Scribner et al. 2001). Remarks: In North Carolina, Menhinick (1991) lists this species as introduced into the New and Tennessee drainages. There are no records of Redbreast Sunfish from Mississippi (Scott and Crossman 1973; Lee et al. 1980 et seq.). It is also not mentioned in the manuscript on Mississippi fishes by Ross and Brenneman (1991). This species is not mentioned as occurring in Kentucky by Clay (1975). In their book on Alabama fishes, Mettee et al. (1996) presented some conflicting information regarding native versus introduced ranges. These researchers stated that Lepomis auritus is introduced to the Tennessee, Black Warrior, and Choctawhatchee drainages, but they listed the species as "native" in their summary table. Erdsman, D.S. 1984. Exotic fishes in Puerto Rico, p 162-176, In: W.R.Jr. Courtenay and J.R.Jr. Stauffer, eds. Distribution, Biology, and Management of Exotic Fishes. John Hopkins. Baltimore and London. Etnier, D.A. and W.C. Starnes. 1993. The Fishes of Tennessee. The University of Tennessee Press, Knoxville, TN. Scribner, K.T., K.S. Page, and M.L. Bartron. 2001. Hybridization in freshwater fishes: a review of case studies and cytonuclear methods of biological inference. Reviews in Fish Biology and Fisheries 10:293-323.